I am currently enjoying THE BAKER'S GUIDE TO COUNTRY LIVING by Louise Miller, a fun "foodie" read. When I took the time to review the jacket blurbs by other authors, Ms. Bauermesiter's comments reminded me of my pleasure in reading this gem. Related stories of why and how people took cooking classes tweak the imagination and the palate. Though not a fan of short form fiction, these individual stories tie to each other in a chapter-like format, rewarding me with a pleasing denouement. The students have come to learn the art behind Lillian's soulful dishes, but it soon becomes clear that each seeks a recipe for something beyond the kitchen. And soon they are transformed by the aromas, flavors, and textures of what they create. Erica Bauermeister’s love of slow food and slow life was cemented by her two years living in northern Italy with her husband and children. She has taught literature and creative writing at the University of Washington and currently lives in Seattle with her family. 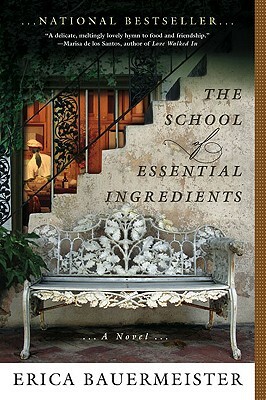 The School of Essential Ingredients is her first novel.